Autumn's colors are soft, warm, and deep. In all three Autumn palettes, you will find many greyed, deep shades of red, peachy-pink, yellow, yellow-orange, yellow-green, green, ivory, and brown. 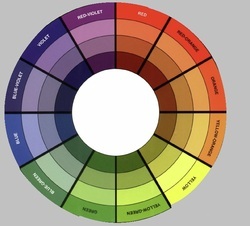 You will see very few purple-blues, light colors, or pure versions of any hue. 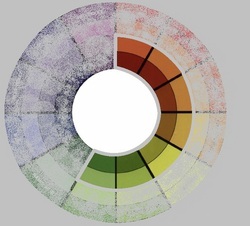 Color wheel with (outside to inside) pure hues, lightened tints, greyed tones and darkened shades. The energy of Autumn's look is practical, natural and sincere. A word about the advertising you see on this site: I'm a teacher with small children, so the potential for a small bit of extra income is valuable to me. I hope your joy in visiting this site is not diminished.